Beautiful Beachside Weddings in Paradise! If you’re looking for the perfect place for your destination wedding, look no further than Costa Rica! Costa Rica is an incredible destination for couples looking to get married in paradise. And now it is easier than ever to plan your dream wedding, thanks to the simple legal requirements, gorgeous locations and variety of wedding venues. 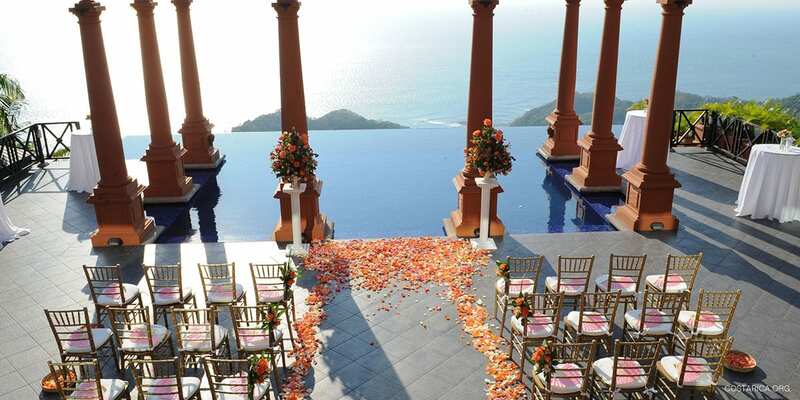 Whichever Costa Rica destination you choose for your special day, you’re guaranteed to be happy. Keep reading to find out how you can say “I do” on Playa Tamarindo, under the Arenal Volcano or in Manuel Antonio National Park. Getting married in Costa Rica has so many benefits! First and foremost, it’s one of the most beautiful countries in the world. You’ll find white sandy beaches all over the country, lush rainforests filled with tropical flora and fauna straight out of Jurassic Park and magnificent volcanoes around every corner. You won’t find better wedding locations anywhere else. Once the wedding ceremony is over, the vacation / honeymoon begins! One major pro of getting married in paradise is the built-in vacation for you and your guests. Costa Rica is an amazing vacation destination. No matter where you choose to get married, you’ll have easy access to at least one national park, beaches, cloud forests and volcanoes, meaning you and your guests can enjoy nature and adventure activities right after the wedding! It also means that you’ll have more time to spend with your friends and family who traveled to Costa Rica. If you want a luxurious, hassle-free wedding, you can visit many of the all-inclusive resorts in Guanacaste, located right on the beach. Perhaps you want something more intimate? Choose a romantic boutique hotel near Arenal. If you want an eco-friendly, nature-inspired wedding, choose one the many incredible eco-lodges all over the country. Many hotels offer custom wedding packages and even a wedding planner who can help take all the stress out of your special day. While My Costa Rica does not have a specific Costa Rica wedding package, we can help you choose a hotel or resort that is perfect for your ideal wedding. My Costa Rica can help you find a top-of-the-line all inclusive beach resort or a tiny boutique eco-lodge for an intimate wedding party. We can also help set up all your guests with hotel reservations and custom vacation packages. My Costa Rica will be here for you during your entire wedding vacation and honeymoon. Let us help you take some of the stress out of wedding planning! Planning a wedding can be hectic and stressful, especially if you’re planning a destination wedding! Not worry though, if you want a hassle-free wedding in a tropical paradise, an all-inclusive wedding is meant for you. Most all inclusive hotels in Costa Rica are set up for small-large weddings and work hard to help you have an unforgettable day. Packages often include a wedding planner, reception space, decorations, wedding cake, officiant and group rates. Some also include a photographer, on-site salon, catering and more. They are experts in tropical destination weddings so you’re guaranteed a gorgeous venue and high-end services for you and all your wedding guests. Host your wedding at an all inclusive resort and you’ll be saying your vows on the beach in no time! Perhaps you’re looking for a more personal, intimate and affordable venue for your Costa Rica destination wedding? You’re in luck, there are dozens of beautiful boutique hotels in Costa Rica that offer wedding services. Many will help you with catering, decorations and venue and allow you to have more say over the ceremony and reception. Getting married in Costa Rica is quite easy when it comes to the legal requirements. With a civil wedding ceremony, your marriage will be legal in your home country. First you must hire a lawyer who will take care of your paperwork for you and officiate the ceremony. You should also budge $1,500-$2,500 for legal fees, marriage registration and other fees that will make your wedding legal. Find a Costa Rica marriage officiant here. Make all reservations well in advance: Costa Rica is a popular wedding destination, meaning that venues and hotels fill up fast! Consider the Costa Rica seasons when making your plans and choosing your location: Costa Rica has a dry season and rainy season that vary depending on where you are. The dry season in Guanacaste Costa Rica is different than in Puerto Viejo, for example. Hire a wedding planner: There are a lot of details to consider when planning a wedding at home, imagine trying to do it in another country! Hire a local wedding planner to help you find the best venue, caterer, photographer, hair dresser, officiant and more. One of the many amazing benefits of a Costa Rica destination wedding is the honeymoon! You will already be in paradise, so your honeymoons begins the second after your vows are finished. My Costa Rica can help you arrange an unforgettable honeymoon vacation package for you and your new spouse. Find yourself sailing into the sunset, horseback riding on the beach, zip lining over the rainforest canopy or relaxing in a volcano-inspired spa just hours after your wedding ceremony. My Costa Rica can also help you find wonderful private villas for you and your family in some of the most beautiful destinations in Costa Rica! Whether you want a private honeymoon for two, an adventure-themed honeymoon with your whole family or a nature-inspired honeymoon for your wedding party, My Costa Rica can help you customize the perfect vacation for you and your partner.